Aside from the Annunciation, the Mass of St Gregory is one of the most common and important painting subjects in which representations of carpets can be found. 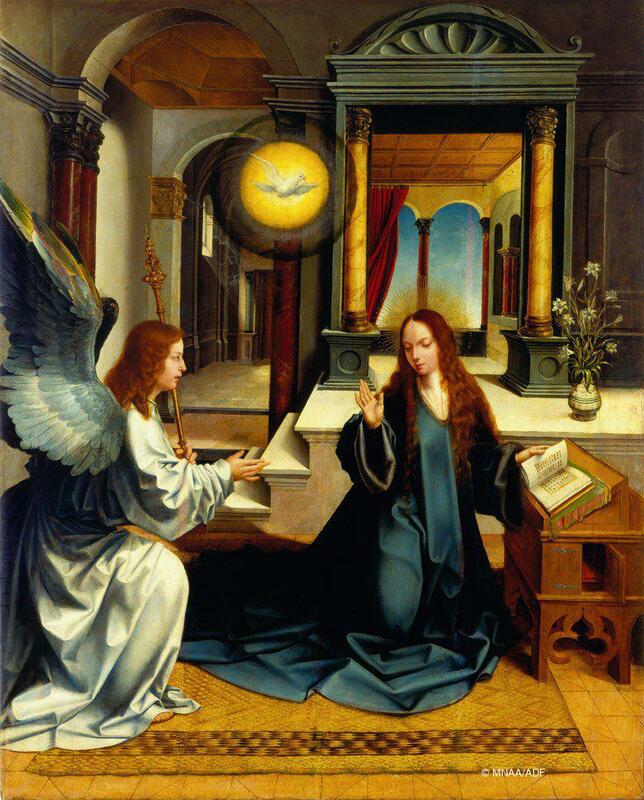 Into one of the crucial moments of Christian iconography, artists transposed aspects of the typical Portuguese feminine interior spaces of the 16th century, with the marked presence of the female dais (estrado). Its use appears associated with the context of Islamic presence in the Iberian Peninsula during the Middle Ages. 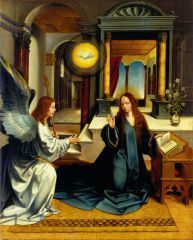 In this painting, the Virgin Mary appears kneeling on a mat: this, along with other similar representations bear witness to the past presence in Portugal of these types of small carpets that are non-existent in collections today. Such is the case of these “mats”, used during the summer as an alternative to the dense knotted carpets of the winter months, as well as of the tapestries, which alternated in the summer period with the guadamecis. The artist’s decision to include a mat, rather than an Oriental carpet, may be down to the painting being commissioned for a convent of the Order of Saint Claire, where the strict rules called for austerity. This appears in opposition to Gregório Lopes’s painting intended for a wealthy clientele. In addition, it all goes to prove the absorption and influence of African artistic production in Portuguese contemporary life and art since the 15th century, when mats, but also other objects such as saltcellars and ivory spoons, began to be imported to Portugal from Benin. Carvalho, José Alberto Seabra, “Madre de Deus Altarpiece”, in Alexandra Curvelo (ed. ), Casa Perfeitíssima 1509‒2009: Celebrating 500 years of the Foundation of the Convent of Madre de Deus, Lisbon: Ministério da Cultura/IMC/Museu Nacional do Azulejo, 2009.